Do you still think to do batik is old fashioned and belongs to the 1970s? Well, just check all these fabric stores plus e-Bay, Amazon and the special online quilt shops for example. No matter which Designer you take, Robert Kaufman, Kaffe Fassett or Moda Fabrics - their latest collections include batik patterns. If you love fashion and to be en vogue you always try to find your own style and underline your individuality, right? Well, if you not only sew or change and restyle your clothes but even design your own fabric in the material and colors you love to create actual individual clothes you can only win. Batik-fabrics can be used for all kinds of handwork like quilting, sewing dresses, blankets, bed covers, table blankets, table runners, even carpets, skirts, tops, pants, coats and of course also bags. Nobody can beat your own style and you can't beat the feeling of "it's mine, I created it". So, go for it! The Wax Method needs several different work steps, a calm hand and a lot of patience. 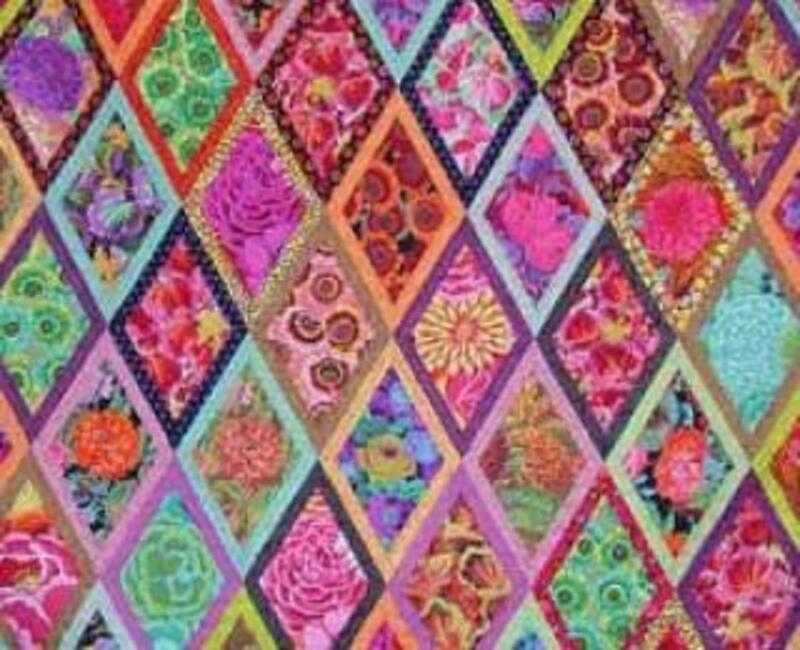 The here used batik fabrics belong to a collection designed by Kaffe Fassett. There are different techniques to batik. The easiest way to learn how to do batik is to take your fabrics or clothes and make different knots into it like shown on the photo beneath this text. But: This is only the easiest way to make a nice pattern on your fabrics. 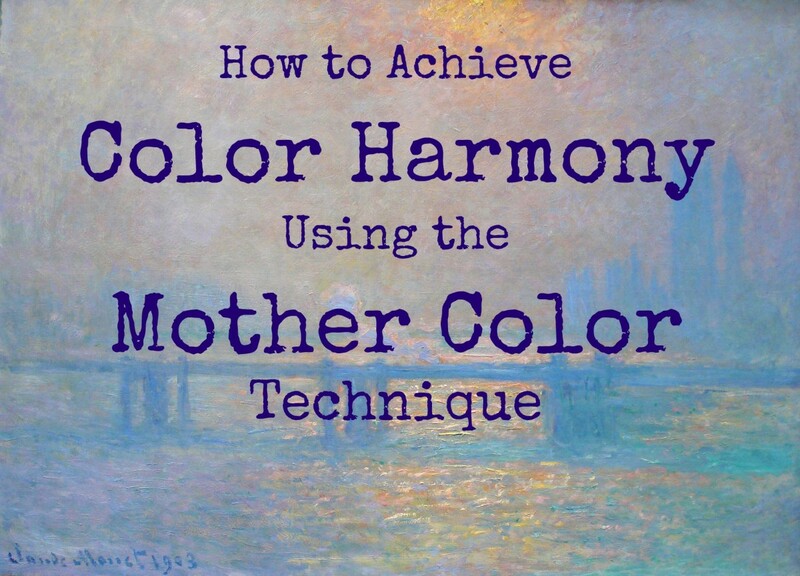 In addition, there are different ways how to bring the color onto your fabrics. As a beginner who never really tried to batik or if you did not do it since your childhood you should try out the simplest technique with the above-mentioned knots to become familiar with coloring fabrics and clothes. Take a small piece of fabric or just an old t-shirt. The knot-technique will keep some color away from your fabric so that the result will be white rings within a colored t-shirt (if you take a white t-shirt). Of course, you can take a colored t-shirt and batik this as well. The only thing you should keep in mind is that it is always easier to color bright fabrics than darker ones. Meaning you can, of course, color a darker red t-shirt, but the result can only be an even darker t-shirt. You could try to turn your red t-shirt with yellow into an orange t-shirt - but your result can only be a very dark orange and will probably be more a dark rust red. The brighter your fabrics the more you can play with the colors and color your clothes in several steps. For your batik pattern you can use everything you want. Here leaves were used for printing. It is not only the colors that you need for a proper batik. You have so many different possibilities that you should try our more than one of these techniques with some old t-shirts before you batik something that you really want to be wonderful. The Colorful Batik Effect - on Paper! Here are the first steps for a simple batik. 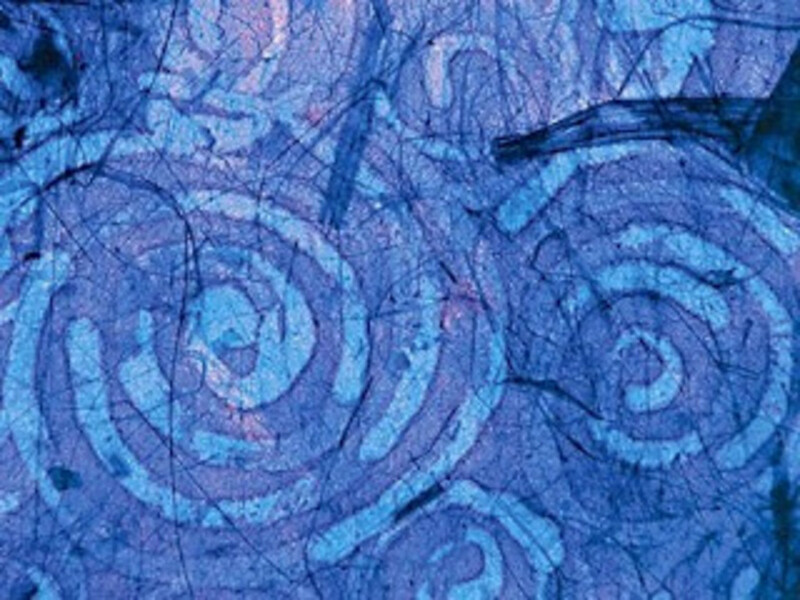 The treatments of the color are always the same for all batik techniques. Heat water in a pot on your cooker to a little more than 60°C (140°F) and give it into an old bowl. Take one bowl for each color. Dissolve the color powder in the hot water of about 60°C (140°F) with stirring. If you like, put some vinegar into the water. Vinegar makes the fabric more receptive and the colors more durable. 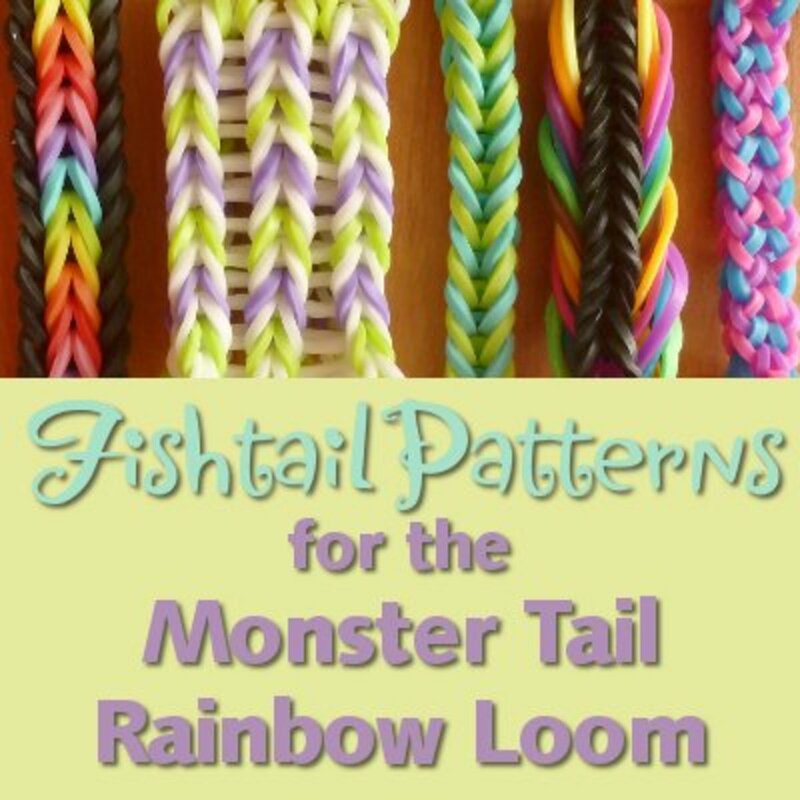 Make knots into your fabric as much and as fancy as you like it or just follow the picture. Put your knotted fabric into the hot color and leave it in it as long as you need or want it. The duration really depends on how bright or dark you want your batik result, but mind that wet colors always look darker. Take your fabric out of the color and put it in an empty bowl where it can lose rest of the colored water for a moment. Put it then on a drying rack and let the whole package dry. As soon as your fabric is dry you can open the knots. You can try out to open the knots earlier and compare your results. This is really a question of taste. If you open it after drying the white lines will be sharper. Iron your dried clothes after batik. Then you should wash it out softly - but by hand, dry it again and iron it again. It is recommendable to wash batik fabrics 3-5 times by hand until there really is no more color running out before you give it into the washing machine together with other clothes of similar colors. Classical batik pattern when you work with knots. You can even paint a batik fabric design. But here are some easier ways that you should try before you become a professional fabric and cloth designer. Keep in mind that the process of coloring these techniques for patterns and the treatment after the coloring process is always the same as mentioned above. Simply take your fabric or clothes and fold it several times. Be creative or totally neat - the results will be surprising. After you folded your fabric you should take one of the bands and tie it up like a parcel. The ties and the folds will absorb less color and show you interesting patterns afterwards. Instead of ties you can also use the clothes pins. Wrap your clothes that you want to batik with cotton ties as close as you can. Wrap it chaotic or totally with your own system. Never use normal wax for batiks. 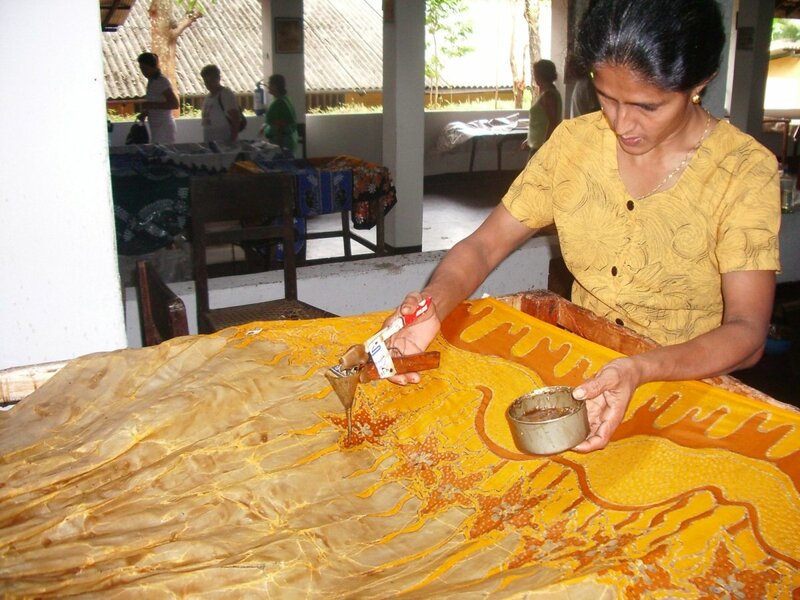 The real batik wax contains more paraffin what makes it softer and easier to remove afterwards. You can drop the wax, paint it with a paint brush or draw fines lines and patterns with a fine tool like a syringe (without any needle of course) before your coloring process. Let the wax dry before you give the fabric into the hot color and keep an weary eye on the wax. Take the fabrics out before the wax gets too soft. As soon as the wax breaks away the fabric will take color at this point. 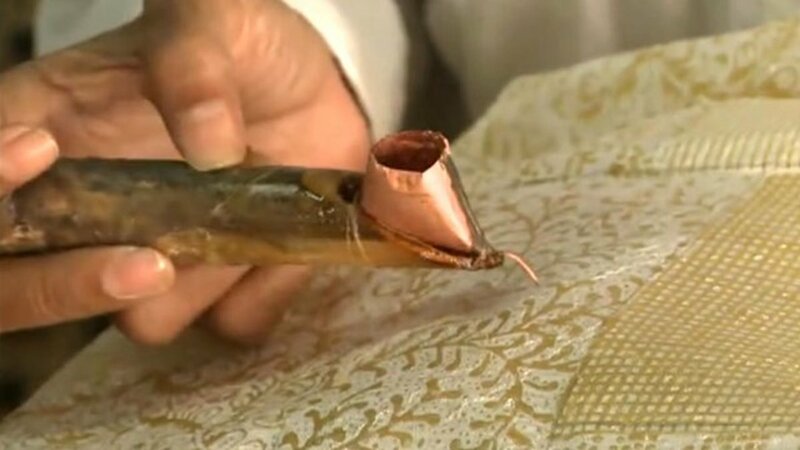 You remove the wax after the fabrics are dried out by ironing it with blotting paper. Sometimes you can even already pull it away with your fingers - but you should know that this will roughen your fabric. You will obtain fascinating results with the salt method. Here you don´t have to prepare your fabric. Just give it into the color as long as you like and take it out whenever you think the result is reached. Spread the fabric over a drying rack and sprinkle salt on it. Be creative and generous. The salt will absorb some of the color and produce wonderful nice and very natural patterns. Let the fabric dry with the salt on it and then wash it out by hand. 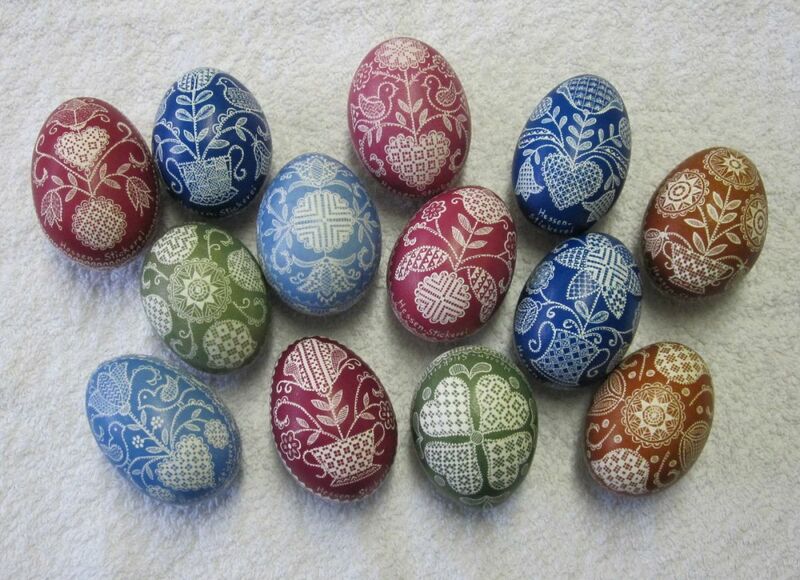 This wax method can also be used for coloring and designing decorations like Easter eggs for example (see picture above). To decorate and design eggs you traditionally take actual eggs, hard-boiled or blown out. Also possible are wooden eggs which you can find in each arts and crafts store, but you will probably have difficulties to color the wooden eggs the same way or with the same colors when waxed. Instead you then simply paint them with usual colors for paintings. Let the color dry and remove the wax. If you want the real eggs to shine and shimmer simply take a little piece of bacon and slather them. The wooden eggs could do with some clear varnish. To decorate the eggs this way is much easier and faster than scratching the pattern you'd like to have out of the colored eggs. You will obtain fascinating results with the salt method. Here you don´t have to prepare your fabric. Just put it into the color for as long as you want, and take it out whenever you think the result is reached. Spread the fabric over a drying rack and sprinkle salt on it. Be creative and generous. The salt will absorb some of the color and produce wonderful nice and very natural patterns. Let the fabric dry with the salt on it and then wash it out by hand. If you are insecure and not used to work with colors and color experiments there is a way to exercise without blemishing any clothes. It takes a little patience and you need a sheet of aquarelle paper, a soft aquarelle brush, a little water, and aquarelle colors. Additionally a piece of fabric just in case you need to take some water off. You then wet your aquarelle paper which by the way should stay fixed in the book - just as you bought it. The fixed paper can't become much uneven by the water. An unfixed single sheet of paper will become more uneven and by this, it will be more difficult to paint on. So, you wet your paper by using your wet brush and painting just a little water all over the paper as if you would do it with any color. After that, you color your brush and dip it into the water on your sheet. No matter which color or if you like it colorful and take different colors. Just drop until the whole sheet is full of color. Let it dry for a minute (depending how much water you took) and give some normal salt over it. Again, try different portions of salt. A pinch of salt in one edge, a little more in another and less in another edge. Maybe you scatter the salt in any circles or hearts - whatever you like. You get the idea. Now leave it alone and let it dry. Don't put it on the heating because the salt will melt. As soon as the color is really dry you can take a hand brush and take the salt off over your sink. 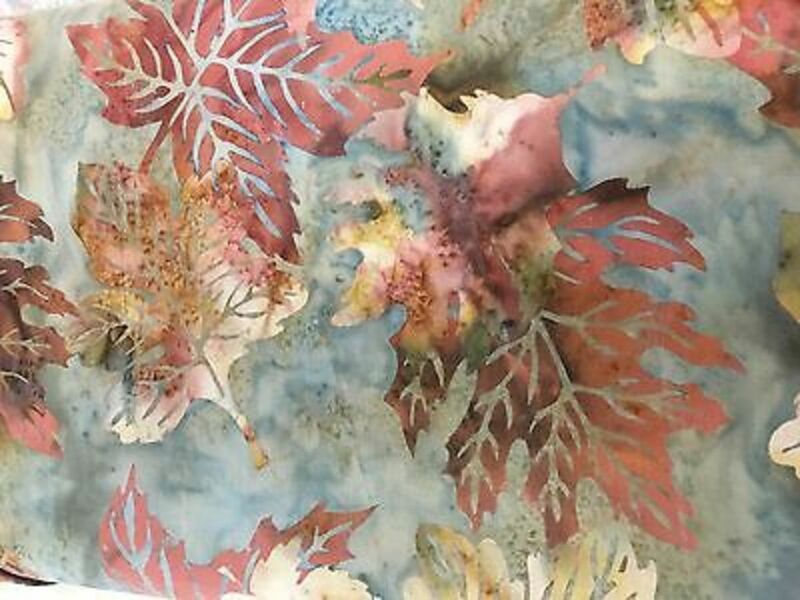 The result shows what you can create with your fabric and salt on the batik colors. Typical German Easter Decoration - first waxed, then colored (usually empty) eggs. Before you wear a re-designed t-short by some batik experiments you should, of course, wash it when all colors are completely dry. Washing will take out some colors. Hence, here some tips how to fix the colors when your piece of batik is really dry. If you like to get a result in brighter, more pastels colors wash it by hand, in hand warm water, fast, short, best under running water and without any detergent or only a little drop of mild detergent. 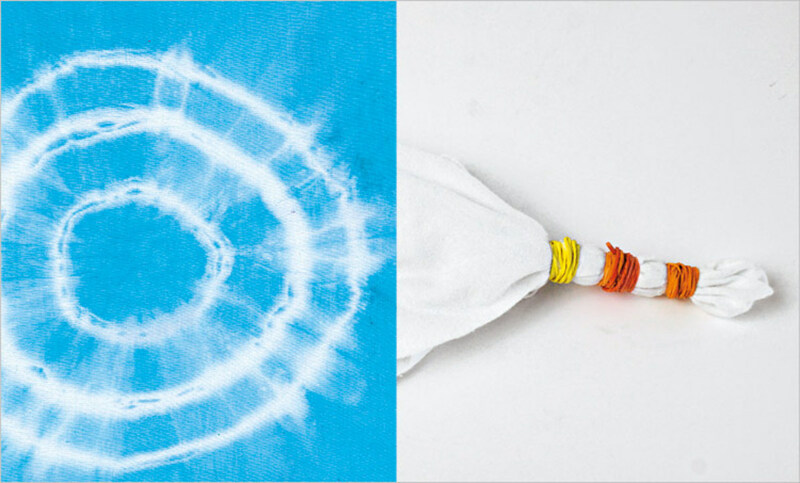 Dry it (best outside as the colors will still run out) in the air on a washing line and iron it afterward. In case your colors became too strong and colorful just wash it a little longer but in the same way as under point 1. Also, dry it in the air as described and iron it afterward. For all pieces, you would like to keep them as they are just let them dry and iron them. Afterward, you hang it on a washing line. The air will do the rest. You can wash it the next day as described. You also can bath the batik pieces in vinegar after the colors dried and then wash them. I personally don't like the smell and still don't get how the vinegar can fix the color, but it is said it shall help. When you want to wash your batik the next time you should do it by hand as long as it still can and would stain other fabrics/clothes. You don't know what to take to create your own fabric which you later take to sew your own clothes? Look what you already have at home before you buy any fabrics to batik them. 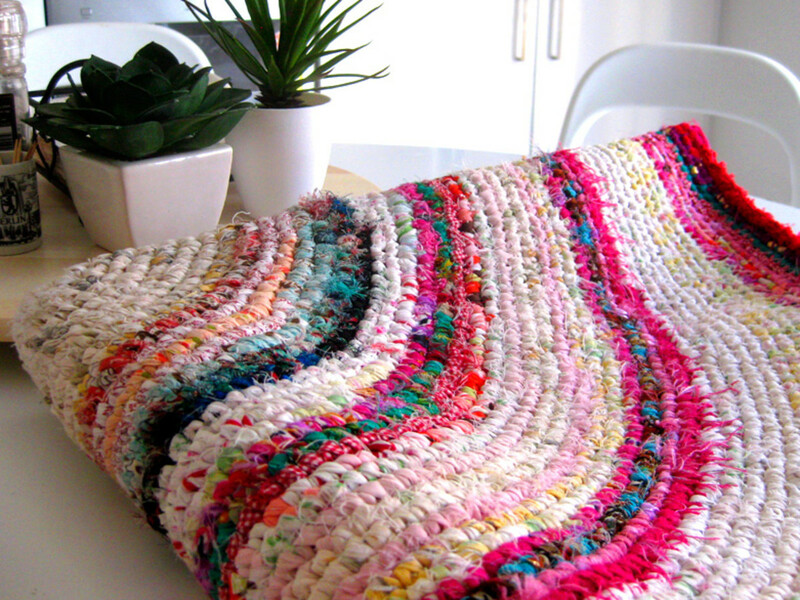 You can take old bed clothes or curtains of solid colors for example to create your self-designed fabrics. I use white bed sheets which I found at Ikea, if I may mention this here. They are 100% cotton, don't cost too much and it is enough fabric to sew something. 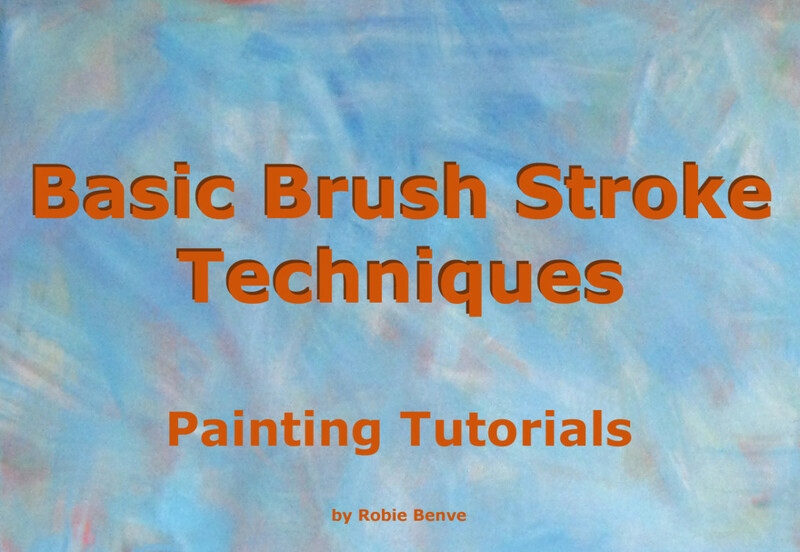 Further, all here mentioned techniques can be mixed and used in different color layers. Meaning you first do the batik in one color, wax the dry result again in another pattern and color it again with another color. It's also possible to add some batik color with brushes when the fabric is dry. 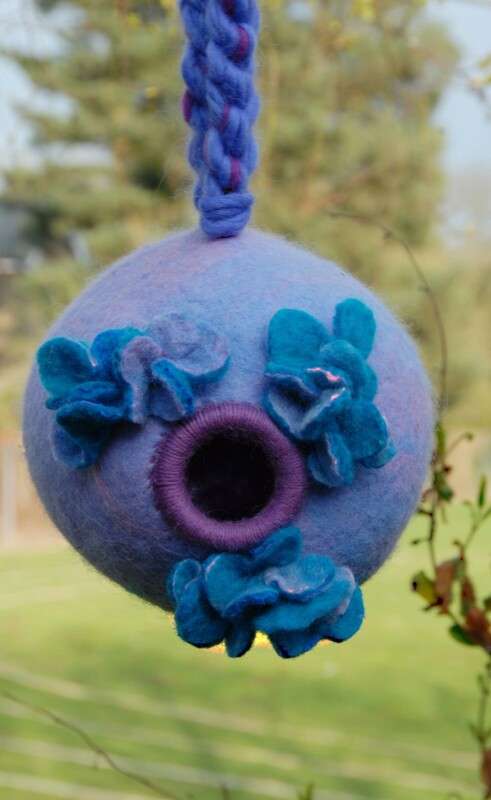 It becomes really creative if you work with embroidered fabrics. Enjoy your creativity and the process of creating something new. Loves to learn,but didn't get chance after watching your lesson thought to give a try,,thank you,,get back to you soon Elisabeth.. Thank you Sally for taking the time to leave a comment. 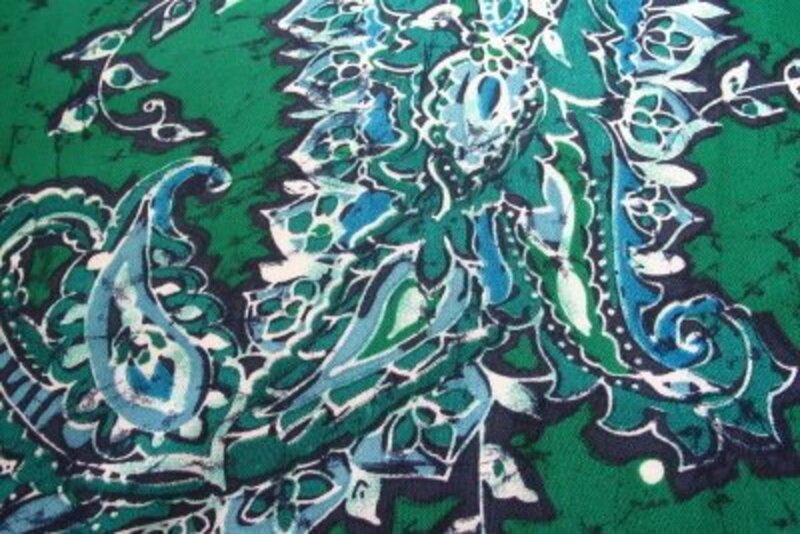 I love these Batik fabrics as well. 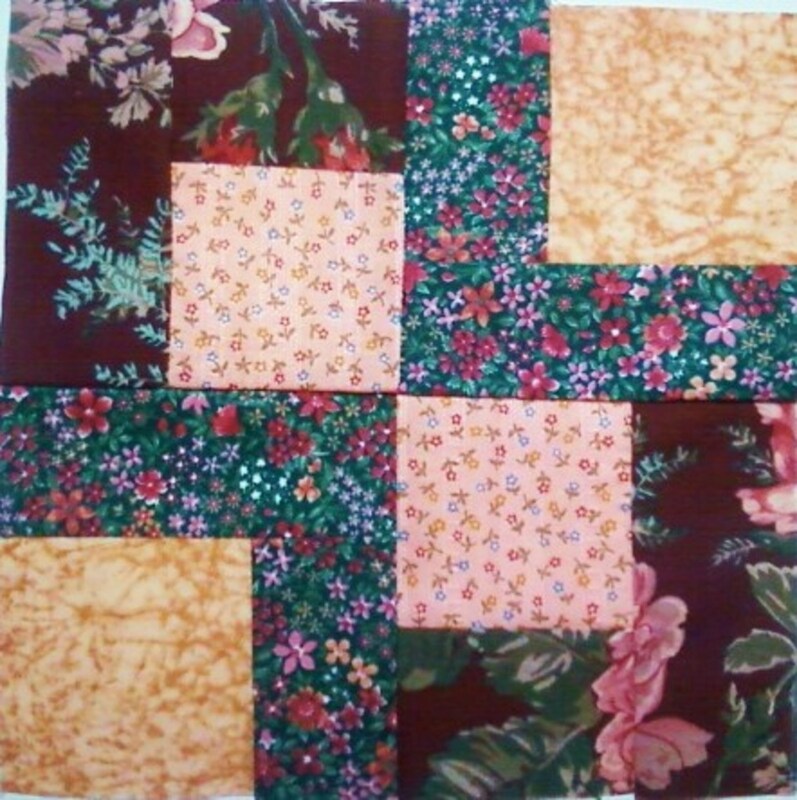 They are great for quilting if you combine them with solids. I always find it hard to decide for one when I'm looking for new fabrics. Hence, I thought about creating my own fabrics. 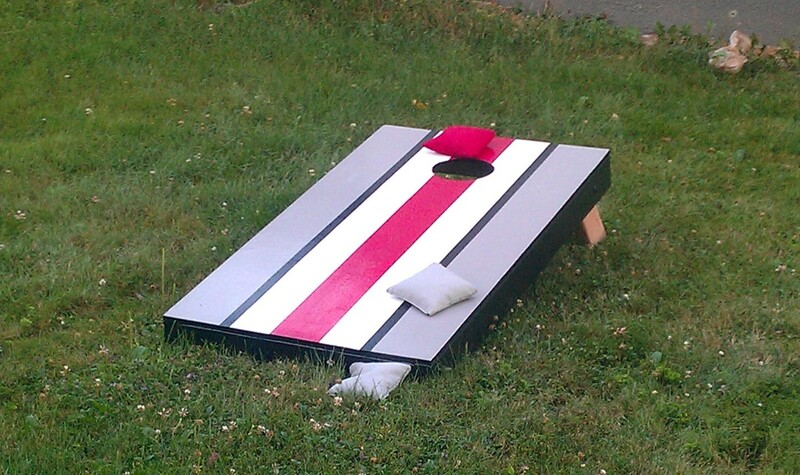 Like you I love creating something with woven and non woven fabrics. We learned to do batiks in school too; I think it was in 5th or 6th grade when we all suddenly came to school with our self colored t-shirts and of course with the tie-dyeing circles. Unfortunately we didn't learn how to felt. I love Batik fabric. I will rephrase that! 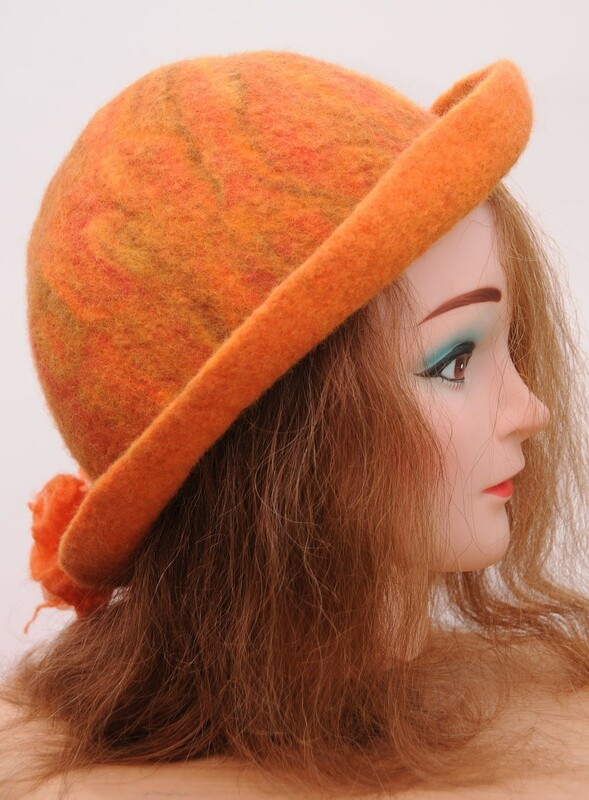 I love all woven materials and nonwoven fabrics such as felt. The actual process of making a batik and tie-dyeing was taught to us at school in South Africa. We used a little brass tjanting tool to paint on the wax and I loved the process.